File personal Bankruptcy with easy-to-use forms and step-by-step instructions. If you have come to the conclusion that Bankruptcy is the best option to escape crushing personal debt, Standard Legal will save you time, stress and a significant amount of money. Everything you need to complete a Chapter 7 or Chapter 13 personal bankruptcy is provided, whether filing individually or jointly as a married couple. Includes all required forms, completed samples for each document, clear overviews, instructions, a list of each state's exemptions, and a complete package of forms from each of the 90+ U.S. District Bankruptcy Courts. Fully up-to-date including the November 2018 Means Test and Exemption Calculations revisions! It's easy for financial situations to get out of control. Sometimes it begins with the loss of a job, where income levels change dramatically. Or perhaps it's the death of the primary wage earner in the family, where the rest of the family can no longer meet the obligations that were taken on previously. Or maybe it's a significant change in the economy, or a consistent debt pattern that has finally spiraled out of control. Whatever the reason for deep, ongoing financial issues, there often comes a time when enough is enough. Creditors call constantly, the debt load and related interest continues to increase, and there is no apparent way out of the situation. Thousands of people and families just like you experience this exact same type of financial difficulty each year. And while it is never an easy decision, sometimes the filing of a bankruptcy is the best decision. If you decide to proceed with the filing of bankruptcy, then Standard Legal's Bankruptcy legal forms software package is the most effective do-it-yourself solution available for either an individual filing or a joint filing with your spouse. A bankruptcy attorney can cost thousands of dollars. When money is already tight, coming up with the amount necessary to hire an attorney can often be nearly impossible. That's when you need a clear way to resolve the issue on your own. That's when you need the directions and overviews provided by a person experienced in bankruptcy who can teach you how to proceed through the filings and paperwork required. That's when you need the information provided by Standard Legal. To be clear: the Bankruptcy process is by no means "quick and easy". Nor should it be; a person filing for Bankruptcy is asking a court to wipe away legitimate debt owed to others. But if your personal situation meets the requirements of the Bankruptcy Court, then the legal forms and instructions provided by Standard Legal are the best available to help you through the process on your own. The instructions and overviews within the program have been written by a long-time bankruptcy attorney; this attorney has handled personally hundreds of bankruptcy proceedings. He has taken that experience and put it into providing not only instructions on completing the necessary documents, but into adding real insight into the process, to help you make the right decisions at every stage. Standard Legal's Bankruptcy forms and instructions fully comply with all recent Schedule revisions. Standard Legal's Bankruptcy legal forms software will help you get a difficult financial situation put to rest, so that you can begin to move forward with the rest of your life. Create your bankruptcy filing today, before the Court further tightens the eligibility rules! IMPORTANT NOTE: persons who represent themselves in a Bankruptcy proceeding (also called "Pro Se filers") may not be given advice from any person, agent or entity because there is no attorney-client relationship in place. This stringent requirement was strengthened even further by the Court in the Bankruptcy Act of 2005. Therefore, we strongly suggest you read the required Bankruptcy Disclosure prior to the purchase and use of any bankruptcy software product. The design format of all Bankruptcy documents are determined solely by the U.S. Bankruptcy Court. Since all documents must follow the Court's format, Standard Legal provides all of its Bankruptcy forms as individual PDF files matching the Court's exact format. Every Standard Legal Bankruptcy form is built so that all required information is supplied quickly by the user directly within each data collection field on each Bankruptcy form. The user moves from one data field to the next simply by hitting the TAB key on the keyboard. There is no need to search through a PDF file to locate an area where information must be provided. Simply click the computer's cursor into the first data field on a form, then hit the TAB key to continue to the next field until all are completed. Keeping the individual Bankruptcy forms separate in this process makes each file size manageable and allows a user to skip forms not required for a particular filing. In this setup, there is no duplication of data entry, either! AREN'T BANKRUPTCY FORMS AVAILABLE FOR FREE FROM THE COURT? 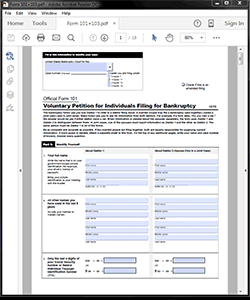 Basic PDFs of all U.S. Bankruptcy Court forms are available online for free. But the Bankruptcy Court's PDF forms have some significant limitations in how they work, as not all PDFs work in the same way. The Bankruptcy forms from Standard Legal are fully-functioning calculation PDFs that are writable and savable. The PDF forms provided by the Court are not. 2) without 'Save Filled', the user must start a form again from scratch if there is an error, change or addition later. For those two reasons alone, the 'Save Filled' forms available from Standard Legal are of great value. - Standard Legal's forms auto-complete any 'like fields'. The forms the Court provides do not always auto-complete the 'like fields' -- so if "Name" is an entry field three times on one form, you must fill in your name three times in three locations on the Court's version. - Standard Legal's forms automatically handle the financial calculations directly within the form. 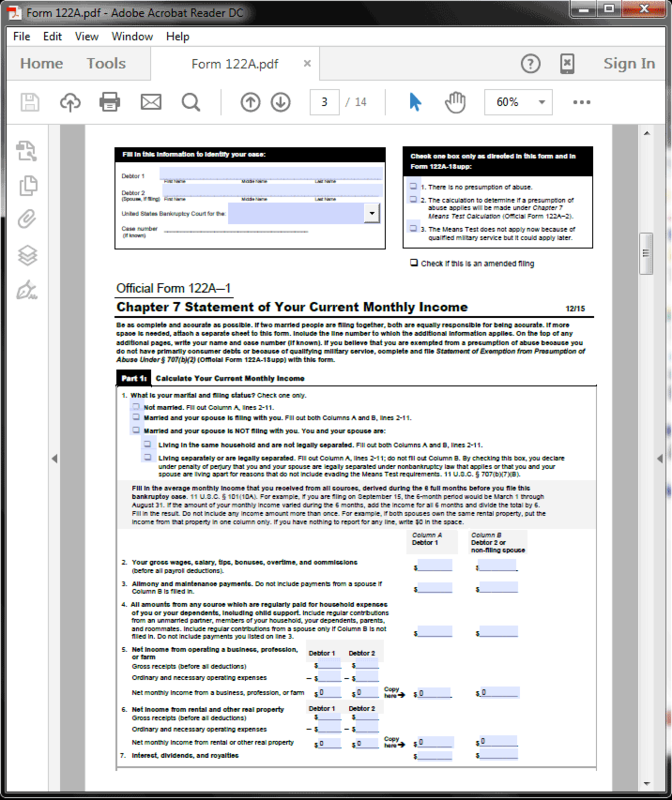 The Court-provided forms often do not calculate the financial fields, meaning that the user must 'do the math' separately with a calculator then type in the result manually for each calculation field. That can take some time. - Standard Legal provides detailed overviews and step-by-step instructions. The Court forms typically do not offer any substantive instructions whatsoever for completing each form, nor do they offer much in the way of Bankruptcy process overview information. - Standard Legal provides fully-completed sample case forms. The Court websites do not provide any sample case forms for review. 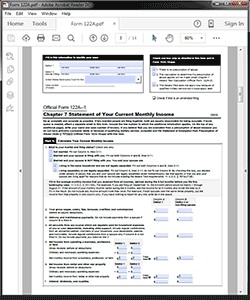 Completed samples can be of great help while working on your own forms. So yes, all U.S. Bankruptcy Court forms are available as PDFs for free online. But how those free forms work, the functionality built into them, and the lack of detailed instructions from the Court means those PDF forms are nothing like the complete PDF Bankruptcy package offered by Standard Legal. Just a note to let you know that I filed my Chapter 7 in Illinois using your software. It went without a hitch! Even the trustee was impressed by the software when I was asked if I had filed without an attorney. Everyone else had an attorney with them, but it was funny because the attorneys had never even met their clients before that day of the 341 meeting. Even though I didn't have an attorney, I felt more confident because I actually knew what was in my petition. Thanks alot!! I used your do-it-yourself Bankruptcy software and to be honest, I couldn't have completed my filing without it. I interviewed local lawyers but I never really felt comfortable with their answers to my specific situation. Plus, the going rate was from $2,500 to $7,500 for my particular case. Instead, I spent less than $100 for the whole process and I already have my debts discharged. I want to take this opportunity to congratulate Standard Legal for a great service; I take great pride recommending the services of your organization. I got a very high praise from the Chapter 13 Trustee in my 341 creditors meeting about the amazing job I did on my Chapter 13 petition. Thank you for your software! I am so grateful for your product. You help give your customers a sense of empowerment during a very stressful and frightening time. And the price just cannot be beat. 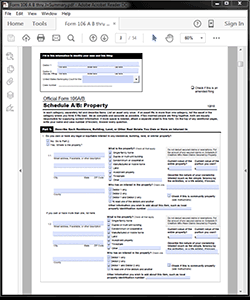 Great forms and a very well put together bankruptcy software package! Very impressed by the simplicity and ease of use. Well, well worth the money spent on it! With Standard Legal's do-it-yourself Bankruptcy legal forms software for personal Chapter 7 and 13 filings, I was able to see the forest through the trees! The software has easy to follow instructions and customized court forms to enter in my personal data, which saved me days of modifying the court forms on my own. Standard Legal takes away anxiety and uncertainty and enables the user to move forward without paying for an attorney. I HIGHLY recommend using Standard Legal's Bankruptcy forms software if you decide to file without an attorney. I just wanted to let you know how successful I was in using your software! I purchased the Bankruptcy title at a time of great stress. I had interviewed several lawyers who all were charging between $2,000 and $5,000 for a Chapter 13. I wasn't sure I could do it on my own, but with the help of your software and the example cases that were included, I was able to file on my own. The Clerk at the filing window was very impressed in the completeness of the documents. But what thrilled me the most was the judge asking me, "Who helped you with this?" My reply was "I did it all myself!" The judge was very impressed, and our plan was approved the first time through. Plus we saved a ton of money! I highly recommend Standard Legal. I want to express my thanks for the Bankruptcy software from Standard Legal. It is easy to follow and simple to understand. I am happy about the money I will be saving in not using an attorney. Thanks again! Standard Legal's software works on nearly all systems, including Windows, Apple, Mac, Android and Linux. A link to a downloadable PDF file is presented immediately after transaction; this PDF file contains an access link with a username and password to Standard Legal's Bankruptcy Forms Server. The Bankruptcy title contains an exceptionally large number of forms, as there are 90+ District Bankruptcy Courts and two types of personal Bankruptcy Chapters. The initial Bankruptcy download contains only the instructions to login to the online forms server, to download the forms specific to your personal situation. The online forms server hosts the most up-to-date legal documents available and prevents the download of forms that will never be used. Once the necessary forms are downloaded they are completed offline; you do not need to be online to complete any of the Bankruptcy forms. 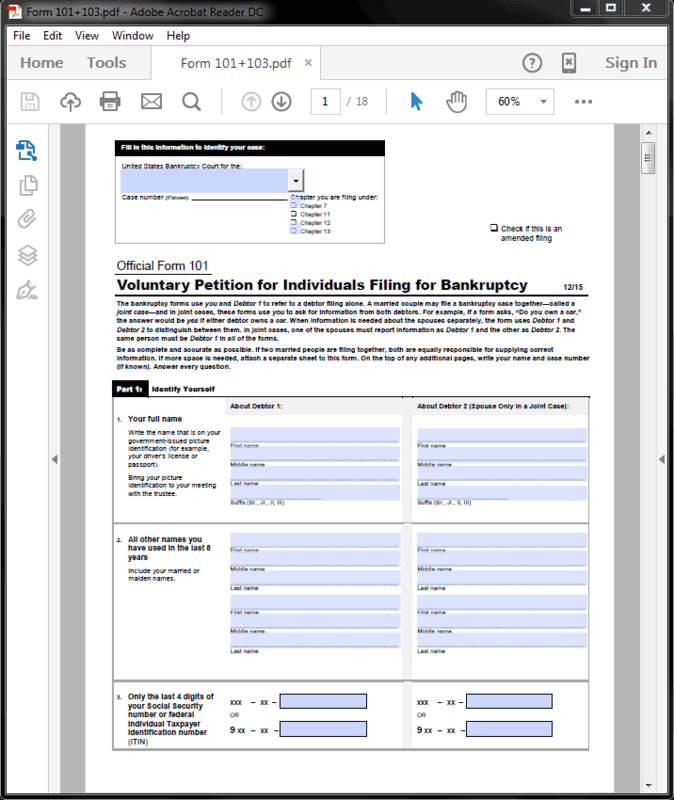 The Bankruptcy forms are provided as Adobe PDF files. 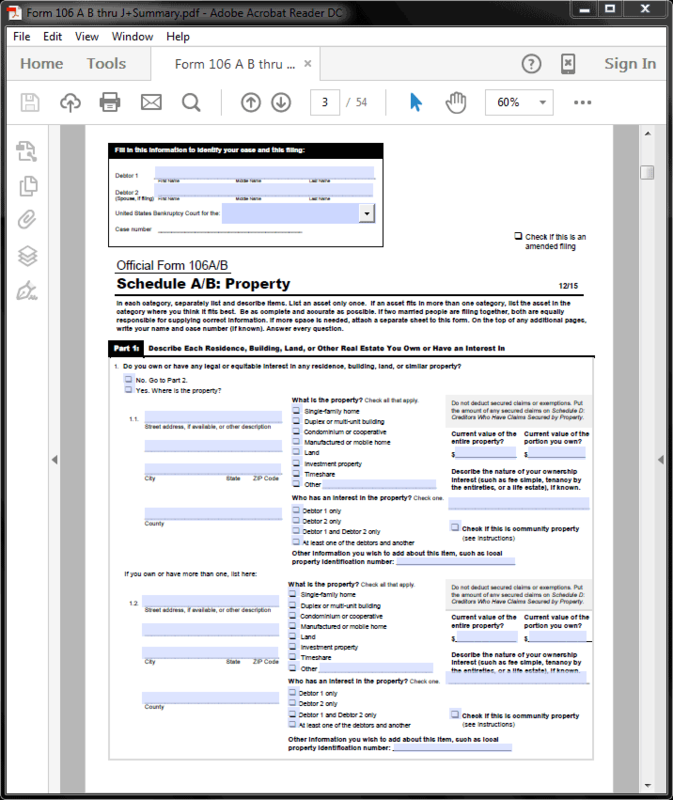 PDF forms requires the download and installation of either Adobe's Acrobat Reader (it's FREE!) or the full commercial version of Adobe Acrobat. Access to the password-protected Online Forms Server requires an up-to-date web browser like Internet Explorer, Firefox or Chrome. Once you access the online forms server, read the instructions provided on the main menu and download only the specific legal forms, overviews and instructions you need. Once all of the files are downloaded, they may be completed offline using the programs listed above.